In 2014, NetsforLife® both doubled the total amount of nets distributed since the program began in 2006, and also distributed double the goal for the year. A total of 111,000 Malaria Control Agents have been trained to date, reaching 41 million people and saving the lives of 112,000 children. Since 2006, the program has trained an amazing 111,000 volunteers in countries across sub-Saharan Africa, who have collectively reached more than 41 million people in some of the most remote areas on the globe. In 2014, Episcopal Relief & Development's NetsforLife® program partnership doubled the number of long-lasting insecticidal nets (LLINs) distributed since the program's inception in 2006, helping to bring malaria protection to new communities and replace worn-out nets from previous distributions. Between 2006 and 2013, trained local volunteers known as Malaria Control Agents (MCAs) delivered and installed 11.3 million nets across sub-Saharan Africa. In 2014 alone, MCAs in 12 countries promoted and tracked the installation of more than 10.6 million nets – double last year's goal – bringing the total to almost 22 million. The NetsforLife® methodology, implemented in collaboration with host governments and through faith-based networks, has three parts: education, installation and follow-up. Communities select MCAs to receive training on key prevention and awareness-raising methods, and MCAs deliver targeted malaria messaging before, during and after net distribution in order to maintain a “net culture” where nets are valued and their use is the norm. Periodic follow-up visits, to check the condition of the nets and gather information on potential or confirmed malaria cases, help ensure that the nets are maintained or replaced as necessary in order to sustain the gains made so far against the deadly disease. According to the World Health Organization, three of the greatest health threats to children in sub-Saharan Africa currently are malaria, diarrhea and pneumonia. Addressing these concerns in a cohesive strategy is essential; therefore, in five countries, Episcopal Relief & Development is leveraging local faith-based networks and NetsforLife® volunteers to expand maternal and child health programming through an approach called iCCM (Integrated Community Case Management). Select MCAs receive additional training, along with kits containing testing and treatment supplies, to act as Community Health Workers, providing front-line care and referring complicated cases to health facilities. More information on Episcopal Relief & Development's integrated health programs is available online, along with details about the organization's NetsforLife® program partnership. Originally piloted in Zambia in 2006, NetsforLife® expanded to 17 sub-Saharan African countries, partnering with foundations, corporations, faith-based organizations and national government agencies to engage communities in the fight against malaria. 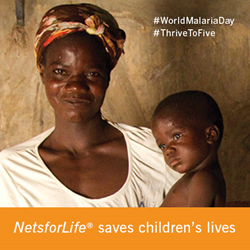 As a result, the number of malaria cases has dropped by up to 45% in areas where NetsforLife® is active.